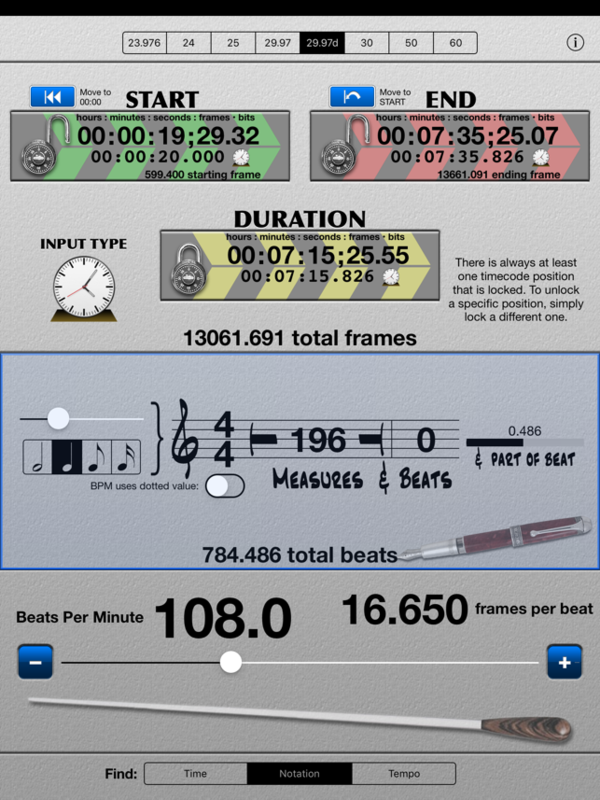 SMPTE Score HD can calculate ALL relationship combinations of; SMPTE timecode, Tempo (beats per minute) and Score length (written measures). 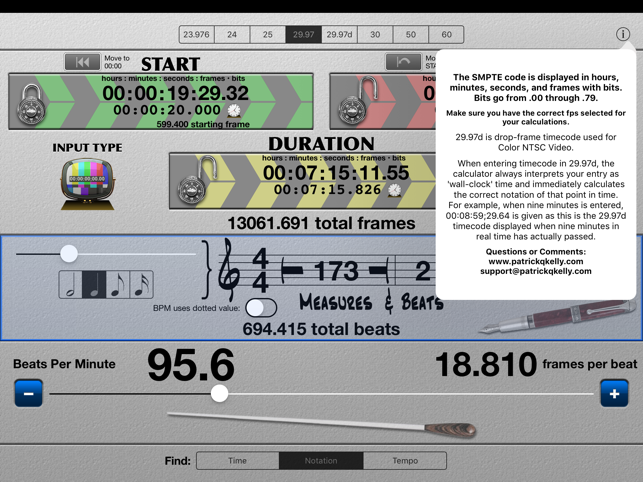 SMPTE Score HD has the added features of a beginning and ending timecode fields which allow for many new possibilities of solving your scoring needs. - Enter your project timecode and have the real (wall) time automatically calculated. - Enter the real (wall) time and have it instantly calculate your project timecode for that exact moment in time. Timecode entered in 29.97d is always interpreted as real time and converted to the 29.97d format for that time. For example, when nine minutes is entered (when 29.97d is selected) 00:08:59;29.64 is displayed because this is the timecode when nine minutes in real time has actually passed. The tempo range is from 5 to 300 beats per minute. If you want to write a song 4 minutes long and at 108 beats per minute, it'll give you how many measures it needs to be (in a given time signature). Likewise, given the number of measures, and the time you want it to take, it'll tell you how fast you need to play it. Or if you know how many measures it is and how fast you want to play it, SMPTE Score will tell you how long it will take. You can also use it as a simple timecode converter - just select between the different timecodes. After you find out that your score in 7/8 needs to be played at 170bpm, check out my other app "Maestro" to see how to conduct it. Updated for latest devices and iOS.